Have you noticed that Virex's eUpdate function reports the May 12, 2003 definitions are the latest available ? Accordingly, that the one you find on .Mac in the Virex section. But since those are over a month old, Virex keeps notifying you that they might be out-of-date .. Check MacAfee or VersionTracker, and you'll notice that the latest version was released on June 1, 2003 (hum). So what's up with .Mac ? After all, isn't it for not having to worry about matters like theses that we pay a subscription ? (thumb down Apple). A workaround is to configure Virex to download the definition updates from MacAfee instead of .Mac. I found the following solution on .Mac's Virex discussion board. Under "Virex 7.2" menu, select "Preferences..."
Toward the bottom, under "Virus Updates," click-on the checkbox "Customize my eUpdate server settings"
Immediately below this and to the right, click the "Server Settings" button which just turned from gray to black. A new window named "eUpdate Server Settings" appears. Click OK to enter these settings and close the "eUpdate Server Settings" window. You return to the Preferences window where you must Click Ok again. and apple would not even answer my e-mails. "There is not enough hard disk space to download and install theis eUpdate. Make space on your hard disk and try again later by clicking the eUpdate icon." I have 65 GB available. Either something's wrong or this is one heck of an update. Any suggestions? Thank you for this info. I am gr8ful. Thanks for the advice. I've been trying to get this to work since I bought my new G4 iMac a few months ago. The folks at Applecare don't even want to here about it...they tell you to call Virex. Tried to explain that I thought the only problem was that the URL for the eUdate server was wrong..."join a discussion group, I can't help you," is all I got in response. Applecare level 1 support ranks as one of the poorest experiences I can recall with customr service. and blaim apple for AGAIN not being able to give us the support we WANT AND NEED!!! The topmost post by Davo works! Thank you!!! This had me worried and then frustrated when I could not find an answer! Finally found this page on a Google search. Thank you again! "Virex is unable to connect to eUpdate server. Please try again later. You can skip the eUpdate and continue using Virex." I have filled out the correct information perfectly as stated above, so maybe someone can tell me what the problem is. Hey, this was great. Thank you. I passed it along to the mac genius I know, just in case they'd like the heads up. Thank you my friend! You have now calmed a [email protected]!%ing annoyed and Virex eUpdate frustrated person. Amazing what a tiny bit of knowledge can do! Thx for the info i was about to give up on Virex, I have a PC as well and for 5 years I have had Norton in the 5 years I have had no complains, everything updates they have new updates all the time, my system has been great in all that time. I got the virex for my mac and it was "welcome to hell" have you guys visited the virex site for the epdates OMG I think blind man made the site, you just cant seem to get to what u need. I was about to trash this prog if it wasnt for htis post. Still no luck using instructions as described on panther. Personally, I've given up on Virex and switch to Intego's Virus Barrier, which offers active protection and updates that actually work. Too bad for Virex and it's fake protection - too bad for dot Mac too.. Mind you, Virex 7 Scripts worked for me. 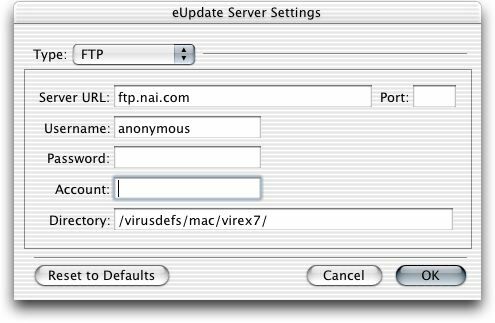 When I tried this (on the free version of Virex 7.5 that I got with my .Mac membership) the FTP item on the Type dropdown was grayed out. I could not select it. Can you help me with this? Any help for 7.5.1 users? Thank you very much for the help with Virex. I followed your directions, and I was able to use the Virex eUpdate. The next time I need to update, will I need to follow the same procedure, or are things still set for me to update again? Thanks again!